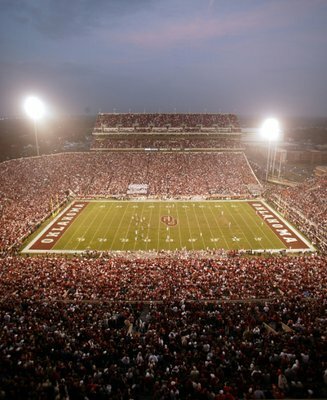 The home field of the OU Sooners is one of America's most recognized college football cathedrals. Situated on the Norman campus, this historic facility is the largest sports arena in the state and ranks among the 15 largest on-campus stadiums in the country and regularly hosts more than 82,000 fans on game days. Home of the University of Oklahoma, Norman is a charming college town that doesn't seem to know that it isn't a big city. Packed with metropolitan amenities like world-class museums, a myriad of scrumptious dining options, a thriving nightlife scene, and a plethora of dance, theater and musical performances, Norman beckons visitors to enjoy all it has to offer. Let these three unique experiences spark ideas for your Norman visit, or visit our Norman page and tailor your own perfect escape. If you are a Sooner fan, there's no place else in the world like Norman to get your fix. The University of Oklahoma has a rich and storied tradition of excellence in academics, athletics and performance art, and exploring these great programs can make for a great escape. Start at the University of Oklahoma Visitor Center where you can schedule a campus tour or get information to take your own self-guided tour. The Prairie Gothic architecture, tree-lined pathways, crimson and cream flowerbeds and the abundant public art displays make the campus an attraction in its own right. No visit to the OU campus would be complete for a Sooner fan without a visit to the college football mecca which has produced seven national championships. If you make advance arrangements, you could be treated to a tour of the practice facilities and the Barry Switzer Center which houses OU athletic memorabilia dating back to the turn of the century. Two other gems on the OU campus that deserve a visit are the Sam Noble Museum and the National Weather Center. Explore the Sam Noble Oklahoma Museum of Natural History where you can walk through over 500 million years of history and marvel at prehistoric giants that once roamed Oklahoma's lands. Then tour the National Weather Center, where you can glimpse state-of-the-art technology, learn about storm chasing vehicles and see 'Dorothy,' the storm-measuring device that was featured in the movie Twister. The University of Oklahoma may be known for its superior athletic tradition, but it also fosters some of the finest artistic talent in the country. The College of Fine Arts not only educates and develops young performers, it also offers a magnificent array of entertainment for the public. Experience OU's fine arts by attending a ballet, musical concert or extraordinary theatrical performance while in town. Stay out and enjoy Norman's nightlife hotspot at Campus Corner just across from the university. With over 75 establishments, Campus Corner offers shopping, dining, live music and clubs. Stroll the lively sidewalks, catch a live show in an intimate setting or sip a cocktail in an upscale dance club. Packed with metropolitan amenities, Norman beckons visitors to enjoy all it has to offer. Where to stay during your Sooner experience getaway? Sooner Legends Hotel, Bar & Restaurant, of course! Located just one and a half miles from the OU campus, this family-owned and operated full-service hotel is decorated in over 3,000 pieces of Sooner memorabilia making it a virtual museum as well as luxurious hotel. Each room is themed around an OU athletic legend from the past and sports 13' pillow top mattresses, goose down comforters and pillows, luxurious linens, Turkish robes, granite bathrooms, flat screen televisions and other high-end amenities. Norman is home to an incredible abundance of arts and culture experiences just waiting to be discovered. Tour wineries, sample fine cuisine, gaze upon world-renowned works of art and take in a live performance to feed your culture craving. The OU campus is home to the fabulous Fred Jones, Jr. Museum of Art with paintings and works by artists such as Degas, Gauguin, Monet, Pissarro, Renoir, Van Gogh, Ansel Adams and more. And don't miss the many fine pieces of statuary that grace the campus grounds around the museum. Then visit The Crucible Foundry, Gallery and Sculpture Garden in the downtown area of the city. Visitors to the gallery can view bronze sculpture cast at the foundry and other artwork created by local and national artists. The sculpture garden presents larger works in a lush, natural setting. Enjoy a light lunch at Seven47 in the historic Campus Corner area across from the university. Or dine in on authentic French cuisine at La Baguette, a bistro with a breezy, casual atmosphere. For dinner, treat your palate to a fine Italian feast at Benvenuti's Ristorante where the menu features brushetta, clamari, pasta primavera, pesto and ravioli, mezzaluna, sea bass, pizza, and more. Visit Canadian River Vineyards & Winery in nearby Lexington to enjoy a complimentary wine tasting, tour the vineyards and relax on the deck overlooking the vineyards with a bottle of your favorite variety. Drop by the historic Jacobson House Native Art Center to peruse the fine art offerings and learn about the history and contributions of the Kiowa Five. The center is the former residence of Oscar Jacobson, the first director of the School of Art at the University of Oklahoma, and the man generally deemed responsible for kicking off the Native American Art Movement in 1926 by mentoring five talented Kiowa artists and helping their works reach a global audience. Complete your artistic journey by catching a live performance at the Grande Dame of Norman culture, the Sooner Theatre. The Spanish Gothic architecture of the historic building has been lovingly restored and the theatre is now the year-round host for concerts, art films, theatrical shows and more. When you need to unwind, Norman is an excellent choice. Escape to this charming town for shopping, relaxed dining, casino gaming, day spas and quiet inns. Stay at the delightful Montford Inn for a quiet bed and breakfast experience. The Montford Inn offers 10 guest rooms in the main inn and six cottage suites surrounding the inn. Beyond outstanding service and luxurious rooms, the inn's claim to fame is that actress Helen Hunt stayed at the inn while filming the movie Twister in Oklahoma. Pamper yourself with a a massage, facial or full spa package at the Lion Salon & Spa or one of the other Norman area day spas. Feeling refreshed after your spa treatment, hit the stores and shop 'til you drop. Downtown Norman offers charming antiques, art galleries and unique specialty stores for a great shopping experience. Or, visit Sooner Mall for all your favorite big-name stores. Of course great food in a comfortable atmosphere is a key component of any relaxation getaway, and Norman won't disappoint in this area. Dine at Othello's Italian Restaurant for delicious Italian food and good times in a laid back environment. Choose from an extensive wine list, cocktails or beer specials and stick around for live music by local artists playing everything from bluegrass to indie rock. Try your luck at Riverwind Casino where you'll find Vegas-style gaming on over 2,300 slot machines and 55 blackjack and poker tables. Attend a big name concert or live show in Riverwind's 1,500 seat showplace theater or enjoy cocktails and video poker in the Energy Bar.